The conference, which is organized by the Council of Anglican Provinces of Africa (CAPA), calls together bishops and archbishops from 400 dioceses in Africa. Invited guests from around the Anglican world are also present. Archbishop Robert Duncan, Bishop Martyn Minns, Bishop John Guernsey and Bishop Bill Atwood are among the Anglican Church in North America leaders who are attending the event. 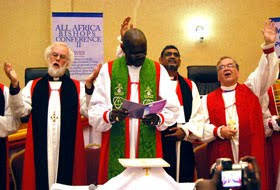 “The Anglican Church is expanding everywhere in Africa. There are now some 400 dioceses spread across the continent. As Archbishop I am here to learn and to stand in solidarity with this vigorous gospel mission,” said Archbishop Duncan. As the leader of the Anglican Church in North America, Archbishop Duncan was included with the other Anglican primates (leaders of Anglican provinces) during the opening Eucharist, and shared in the distribution of communion, as did the Archbishop of Canterbury, Rowan Williams. PBSchori wasn't invited? She was probably attending a Planned Parenthood rally or blessing some new Wiccan "Easter" (Solstice) liturgy. This is what Worldwide Anglicanism has devolved into, gesticulating like fans at a football match? Small wonder so few take them seriously. I'm not sure what you are talking about RMBruton. There was no "gesticulating" during the video, the hand you see on the opening is just the opening boilerplate video introduction to Anglican TV. The speech itself was as "proper" and "Anglican" as one could possibly ask for. I'm not referring to the video, I'm referring to the photograph at the top of the article. I agree with RMBruton. Rowan needs to put his hands back in his pockets and just mumble. Duncan can do whatever he wants; he's an American. That guy in the back, I don't know what his problem is. The celebrant is perusing the menu deciding what to have for lunch. Seems a good time was had by all which is what Anglicanism is all about anyway.